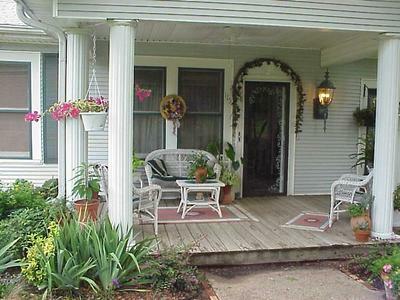 Plain but comfortable front porch. The excitement of painting your beautiful front porch builds for days, maybe even weeks, as you dream of the relaxing space that will soon come to be. The wood has been sanded and primed, the paint colors have been selected, and the only thing left to do is paint away. With old painting clothes on, you pry open that first can of paint, dip the brush in and make that first brush stroke. Your excitement wanes a bit as the color looks slightly off compared to what you had envisioned. Still, you keep going, hoping that when the paint dries it is the perfect color. Far too often, that first impression of it being the wrong color is accurate. 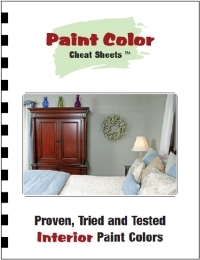 Painting mistakes on the interior of your home are far less troublesome than those made on the outside. Not only are they in plain view of the neighbors, but they also lower your curb appeal until they are fixed. How you paint your front porch can make or break the look of your home, so choose colors carefully. One way to make your porch a natural transition space into your home is by making it blend in with the house color itself. If your siding is a light tan, paint the porch beams and rails the same shade. This will draw the eye naturally toward the front door without being caught in an onslaught of colors that do not coordinate with the rest of the house. If you want to brighten the porch a bit, but still have it blend, try painting some of the accent details on the banister or porch rails a color that is found in the shutters or the front door. Tiny splashes of color are also perfect for the outdoor furniture that beckons you to come rest on the porch. If blending in is not what you had in mind, you can make your porch stand out in a way that is not only appropriate, but attractive as well. Victorian homes look very appealing when their porches stand out because of the attention to detail in the designs of the porch construction. In cases like this, colors that are appropriate for the era of the house are the way to go. Bright neons or bold modern colors can make the porch seem strangely out of place and disconnected from the rest of the house. Instead, choose colors that accent the era of the home’s construction and that also complement the existing colors of the home’s exterior. Trust your instincts when it comes to choosing colors for your porch and paint small sections at a time. It is much better to try out a small patch of color on the inside of the porch rail than it is to paint an entire post the wrong color. If you make a mistake in choosing the color, simply wait for it to dry, sand it down and start again after priming. Correcting a small mistake is much easier than repainting an entire porch just to try to convince yourself the color is right. I’m repainting my porch, and I think these are great tip about painting. I’ve really been trying to accent the front yard landscaping by renovating the porch. The front of my house looking pretty good so far.